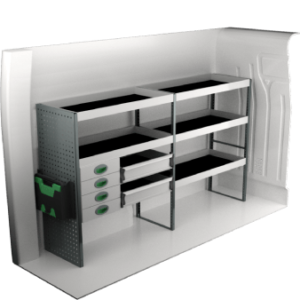 Edström Van Racking is offered for a range of Renault panel vans. In order to operate in tough conditions while providing ease of use, Renault panel vans need van racking suited both to the van and most importantly, to you. The smallest model, Kangoo, is packed with a range of clever and practical features making life in both the cabin and loading area easier while saving you money. This includes an optional sliding roof flap which allows the vertical storage of oversized objects. With the mid-range Trafic model, you get a practical, comfortable and safe van fitted with the latest high tech driving and safety features which can carry 3 Euro pallets in the SWB version as standard. The largest Renault panel van, Master, is available in four different wheelbase lengths and three roof heights, which enables you to maximize the space to suit your needs. It boasts load volumes of up to 17m3 and payloads of up to 1,593kg (3.5T versions) and 2,167kg. More info on complete van racking systems for Renault vans is available in our custom Renault panel van spec sheet. Feel free to get in touch with us or one of our dealers when you have any questions. 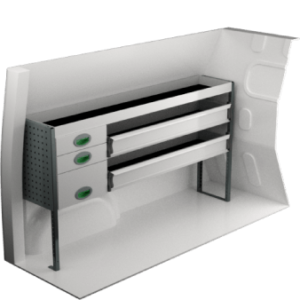 Renault Van Racking Accessories help keep your van tidy and organized. 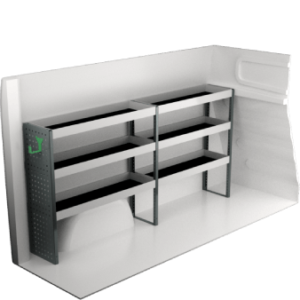 These range of accessories are usually available in both universal single and double units as well as complete van make and model specific packages. They are of high quality. Strong and effortless to assemble.